It’s good to be Ulta. The cosmetics chain recently reported ecommerce sales of $55.9 million in Q2 of 2016, up 54.8% from $36.1 million in the same period in 2015. Ecommerce accounted for 5.2% of sales during the quarter, compared to 4.1% last year, thanks in large part to the company’s doubling-down on its digital marketing efforts. Through the first half of fiscal 2016, ended July 30, Ulta’s online sales were $116.9 million, up 45.9% from $80.1 million in 2015. Ecommerce accounts for 5.5% of overall sales in 2016, compared to 4.6% in 2015. 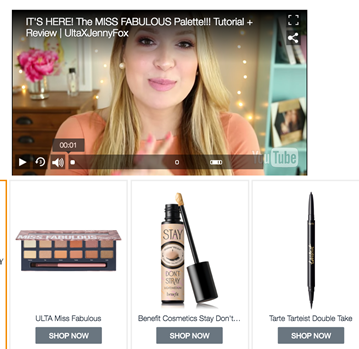 So what can we learn from Ulta’s success in their digital ad campaign? 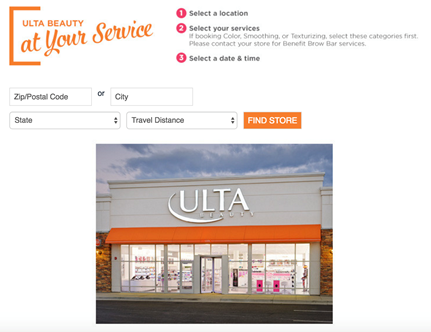 In a day and age in which consumers’ purchasing behaviors are inseparable from their online experience with a brand, Ulta’s example shows us that it’s increasingly important for retailers with physical locations to establish an online presence and nurture relationship with customers when they’re not in-store. 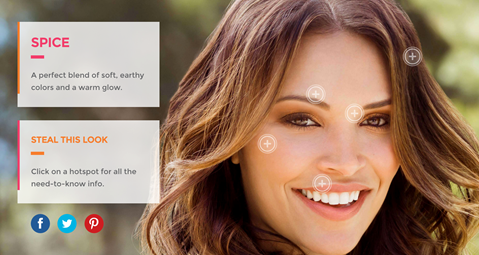 It’s clear that the company’s online marketing campaigns are more than skin deep. Their visual elements and brand-building creative assets are supported by relevant content designed to encourage purchases, drive relationship- and traffic-building social media engagements, and successfully integrate the company’s online and offline experiences. 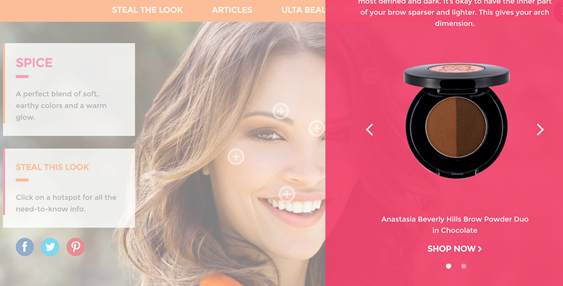 The centerpiece of Ulta’s recent digital marketing effort is Ulta Beauty Mix, a new micro-site that serves as a “destination” to provide visitors with tips, articles and how-tos with the goal of improving customer experience and building consumer relationship. This micro-site features engaging visual content that’s interactive, that’s easy to consume, that’s relevant and that encourages social sharing. Colored visuals can increase people’s willingness to read a piece of content by 80%. 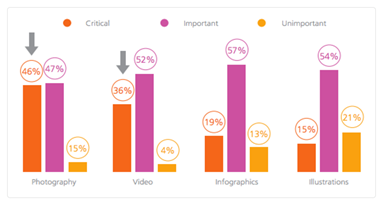 46% of marketers indicate photography is critical to their current marketing strategies. 51.9% of marketing professionals name video as the type of content with the best ROI. Further, the “articles” section of Ulta’s website features content on a diverse number of topics – some of which are evergreen, while others are seasonal. Regularly publishing new content gives visitors an incentive to come back to the site frequently for new tips (not to mention, fresh content is also great for SEO and helps drive new visitors to the website). The articles on the blog are not only informative; many of them are also interactive and deliver a rich multi-media experience, which increases both engagement and conversions. 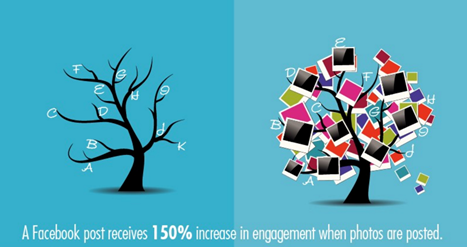 Interactive content helps cut through the clutter and grab visitors’ attention. It also delivers educational content and how-tos that highlights how Ulta’s products are relevant to the visitors’ wants and needs. Essentially, the brand builds trust and goodwill by delivering value, while also showcasing the various ways consumers can use its products to achieve the beauty results they want. Really, it’s no surprise that such instructional content has been found to boost ecommerce sales. When visitors enjoy and act on the content Ulta publishes, their involvement with the brand is deepened, making it more likely that they’ll eventually purchase the products they explore through the company’s content. 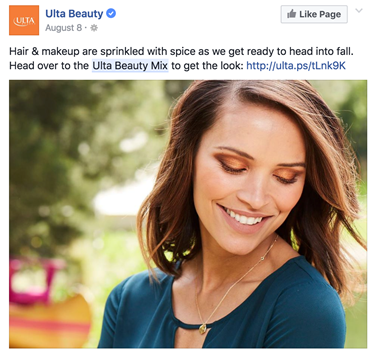 To further enhance customers’ involvement with Ulta, social sharing – an important strategy in building engagement – is built into the Ulta Beauty Mix site and encouraged through the prominent placement of social share buttons on every page. The “Ulta Beauty Love” section, in fact, is entirely devoted to encourage social sharing. When visitors click on an image, a lightbox appears with a call-to-action to share on social media. When visitors share these images with their social network, they also act as social proof that the visitors enjoy the content of the website enough to encourage their friends and followers to check out the brand. Ulta’s investment in engaging content clearly reflects a major investment in the company’s digital presence. 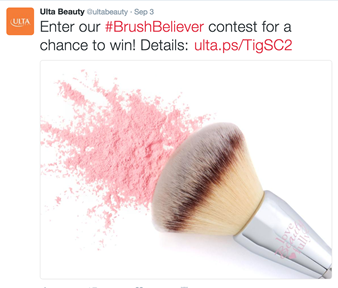 In Ulta’s example, social CTAs are integrated directly into channel imagery. 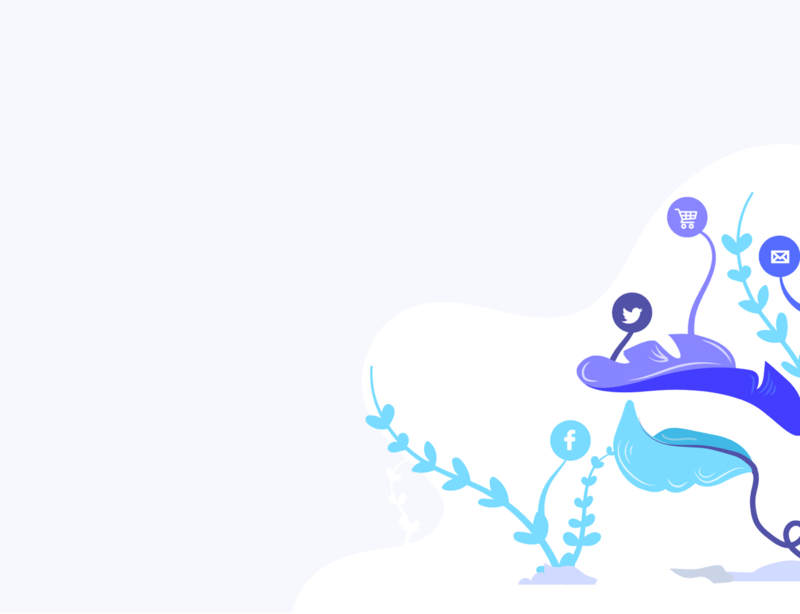 But if adding these features goes above your capabilities, consider the results Eventbrite saw simply by asking users to share their recent purchases on Facebook or Twitter. Embedding social share buttons into your site’s checkout pages with a strong CTA is an easy way to engage customers in your site’s content and messaging. 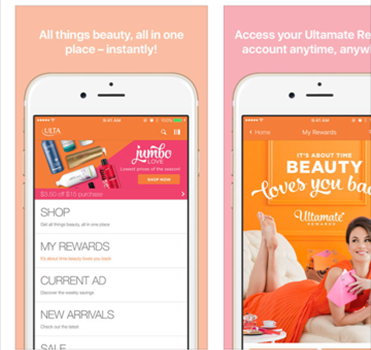 Not only does Ulta Beauty Mix deliver engaging content, it also allows visitors to “get the look” instantly with shoppable content. Tightly weaving content with commerce no doubt contributes to the dramatic increase in Ulta’s ecommerce revenue by reducing friction in the purchasing process. 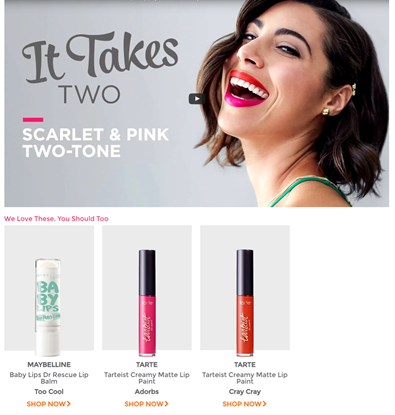 The site’s shoppable content is most prominently featured in the “Steal the Look” section, which delivers value, inspires visitors to “get the look” and provides “instant gratification” through a seamless ecommerce experience that directs visitors to the products’ page on Ulta’s ecommerce site. When visitors click on the “+” sign on the image, a piece of content slides in with how-to information ending with a call-to-action to purchase. 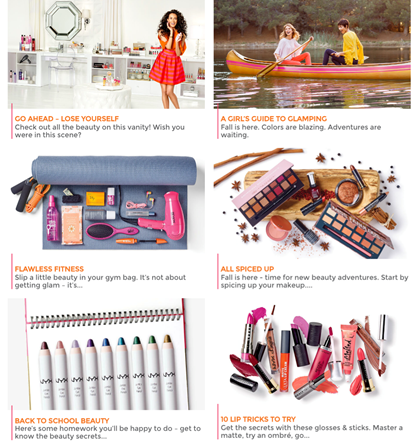 Shoppable content is also available in other sections on the site, including “Articles” and “Lip Happily” to drive traffic to Ulta’s product pages. 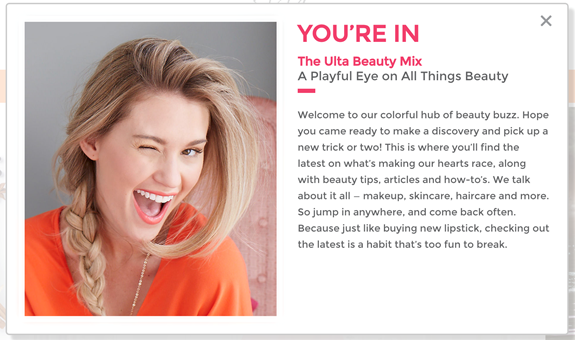 Besides Ulta Beauty Mix, the brand also engages beauty bloggers to produce “shoppable” videos in which visitors can watch a blogger tell her story from within Ulta’s website (where they’re then, conveniently, able to make a purchase). Add shoppable content to your website. It’s that simple. If you can’t handle the custom coding yourself (or if you’d rather not reinvent the wheel), plenty of tools exist to make the process easy. Zmags, Yotpo and Shopbeam are just a few of these options, though you’ll need to do some digging to determine which plan makes the most sense for you in terms of pricing and available features. After investing in engaging and shoppable content, it’s time to supercharge its impact on ecommerce by building awareness and driving traffic to the website. The nature of the Ulta’s products lends itself well to an image-rich promotional strategy that performs well on social media. Besides encouraging content sharing from the company’s website to its social media channels, Ulta’s standalone social media presence is an integral part of its campaigns. 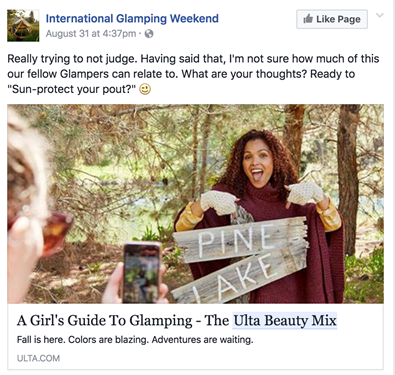 The brand’s Facebook page regularly posts content from Ulta Beauty Mix, featuring timely and seasonal tips and resources that, in turn, drive traffic to site. The brand focuses heavily on using images and videos on their Facebook page and Twitter profile to boost engagement. The consistent styling of the images creates a branded look, in addition to providing a seamless experience to visitors who click through to the website. In addition, almost every post includes a call-to-action that drives traffic to the brand’s website, where visitors can consume more content and purchase. Ulta also runs contests to encourage engagement on social media. The #BrushBeliever Contest, for example, drove significant social sharing of user generated content. 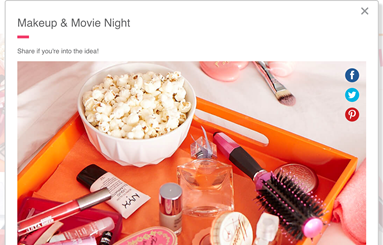 Ulta not only uses social media to share the latest news and promotions, such as its 21 Days of Beauty campaign. They also leverage the opportunity to practice social listening, provide customer service and build loyalty by interacting directly with followers. Social engagement can take on a number of different forms, and the opportunity that’s right for your brand may not suit another. That said, don’t let the vast number of social engagement options out there intimidate you into doing nothing at all. Instead, pick one of the following strategies and make it a priority over the next quarter. If you don’t see the results you’re hoping for, choose another option during the following quarter (remember, social engagement can take time to grow!). Post image-heavy updates at least 1-3 times per week. Snappa, mentioned earlier, is a great tool for this, as is the free version of Canva. Even better, use tools like Inselly to turn your social channels into their own shopping destinations. Regularly comment on and share industry news. Doing so has the added advantage of turning your brand into a thought leader consumers rely on for regular updates. Run a contest. B2C companies in particular will want to explore hashtag-based user-generated content (UGC) contests that leave your brand with assets that can be leveraged after the contest is over. Tools like Wishpond make it possible. 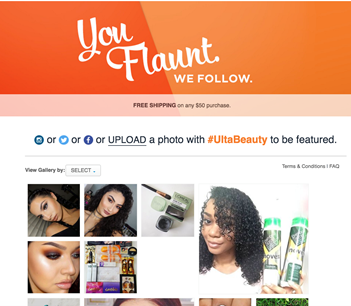 Speaking of user-generated content, in 2013, Ulta launched the Beauty LOLs campaign featuring UGC alongside a contest that resulted in a 9.5% increase in brand awareness, 10% increase in ad awareness, 9.4% increase in message association and 11.6% boost in visit intent. 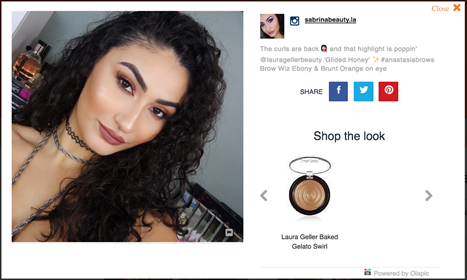 Ulta has continued this winning streak by engaging with consumers through UGC in their recent campaigns, such as the #BrushBelievers contest and on their website’s Social Gallery section, where fans are asked to upload their photos to Instagram, Facebook or Twitter with the hashtag #UltaBeauty. They target their fans’ passion in beauty while tying the content to their products in order to encourage their fans’ followers to “get the look” and purchase. 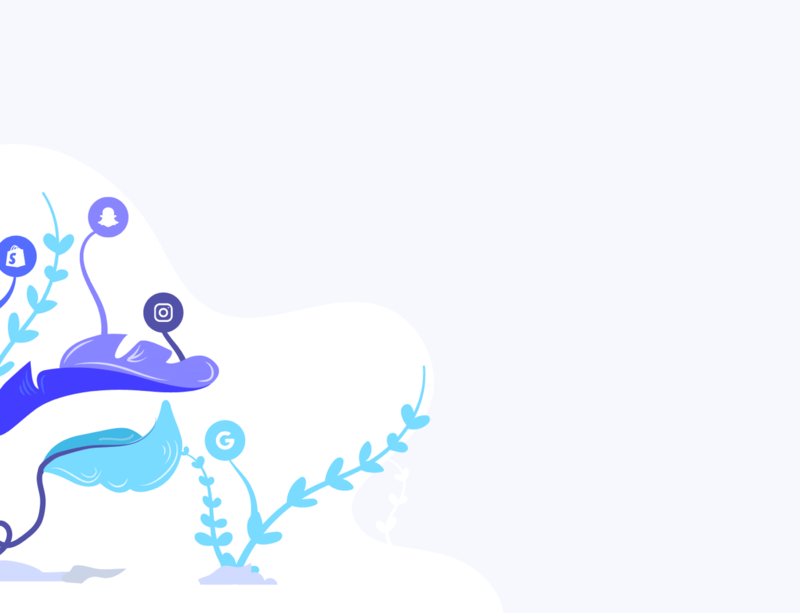 They provide multiple channels on which fans can submit their content, while focusing on the three social media platforms where they’ve built the most influence to avoid spreading their efforts too thin. They reward entrants with “social clout” in the form of being featured on the website. They strategically use hashtags to link the UGC with the brand’s social media posts, building awareness while indirectly increasing traffic to the brand’s website. When visitors click on the thumbnail, a lightbox appears featuring the social media post as well as shoppable content to drive sales. Target people’s passions, by encouraging participants to share content that’s personally meaningful to them. Provide multiple ways for people to submit their content, by offering options to enter via text, photo, video or other content type. Reward entrants, by ensuring everyone who participates – not just the winner – walks away with something. Use a hashtag, to drive participation across multiple social platforms and after the contest has ended. I’d add one more to this list: make your promotion offer stand out. Social contests and giveaways are becoming increasingly common, which makes it more difficult for your brand’s promotion to stand out. You may not have the budget to do something extravagant, like sending the winner on a week-long tropical getaway. But imagine the kind of interest you’d drive by giving a street-style blogger the chance to be featured on your fashion website or by offering a year’s worth of free snacks, rather than offering yet another 20% off coupon or free product. Even though Ulta’s ecommerce presence is growing, it still accounts for just over 5% of their sales as of the second quarter of 2016. Since most of the brand’s sales come from brick-and-mortar retail locations, it’s important that its online presence integrates well with the company’s offline marketing efforts by not only driving sales but also raising brand awareness and attracting consumers to their physical stores. Unsurprisingly, Ulta has found that many of their target consumers “webroom,” doing their research online before going to retail locations to purchase the products. To support this behavior, Ulta makes finding a store and booking an appointment easy in an effort to connect the online experience to offline. Ulta has also found that mobile has been contributing significantly to the brand’s online success, as shoppers on mobile devices account for more than 60% of overall ecommerce traffic. 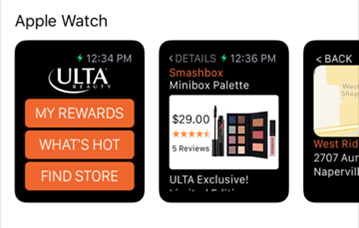 To capitalize on this trend, Ulta recently released an updated version of its app on Apple and Android devices to further encourage engagement and purchases. The key here is to know your customers. Do your buyers webroom, like Ulta’s? If so, providing them with extensive, easy-to-access online resources is critical. Are they buying through your mobile app? In that case, it’s critical that you provide them not just with a responsive website, but with one that’s optimized so that the information they need to move through the sales funnel is immediately apparent. As consumers continue to get more savvy and the line between online and offline experience continues to blur, it’s essential to have an integrated approach to digital marketing campaigns that delivers a seamless user experience that takes visitors from education to engagement to purchase. You may not be able to invest at the same level as beauty giant Ulta, but you can learn from them. Follow their example and consider all aspects of your online presence in order to create a consistent user experience that wins fans, builds trust, generates conversions and establishes loyalty.